represent a danger in the garden or pond. The Hozelock Cyprio in-pond lighting system is produced to a high quality design, based upon our experience of outdoor electrical products. All components carry a 2 year guarantee. (Except for lamps). A transformer is included in the three light set. As the system works off a 24v low voltage supply, installation is simple and does not require a qualified electrician. The low voltage cable can be either camouflaged or buried. Cable lengths of up to 50 metres can be accommodated. Five different lens colours are available as accessories so that a variety of effects can be achieved. A full range of accessories, such as extra cable and connectors is available, to enable the system to be added to. 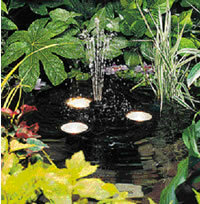 The in-pond lighting system is fully compatible with the Hozelock Decorative Garden Lighting range. This further enhances the flexibility and economy of the system. 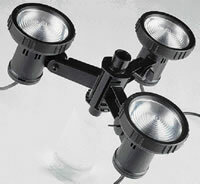 Up to three extra lights can be run as an addition from the transformer for the 3-light set.